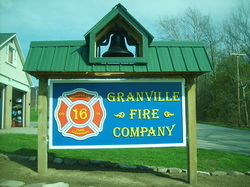 The Granville Fire Company has been around since 1945. We currently serve our community with five pieces of apparatus (Engine, Tanker, Utility, Brush, and Boat) with a membership of 26 Firefighters and other Administrative and Social members. We are located in Granville Township, Mifflin County. The Township is served by two other Fire Departments along with us, West Granville in Strodes Mills and Junction Fire Company near Lewistown. Our area is covered by a variety of settings from Mountains to the Juniata River to several small businesses. We are always looking for new members so feel free to stop by the Firehouse if you are interested in joining. $90 - State Route 103 North from Race Track Road to the Granville/Bratton Township Line and all places in between. What is an AED Call? Company 16 Participates in the Mifflin County AED Response Pilot Program. This program was initially formed in 2009 with only the Granville, City, and Highland Park Fire Companies wanting to participate. The AED responses would mean the participating departments would be automatically dispatched to the top 5 highest probability cardiac arrest incidents, to possibly deliver a life saving shock prior to EMS arrival. The 5 categories are: Cardiac Arrests, Unconscious/Unresponsive Person, Seizures, Breathing Problems, and Chest Pain. Since the inception of the program, Junction, West Granville, United, and Brooklyn Fire Companies have joined in the program.